Single size blanket or 3m of warm fabric, 4m if you're tall. 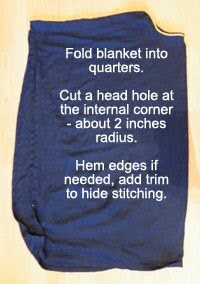 Get a single size blanket and fold it into quarters. Cut a small hole for your head. Hem it. This image shows how you should hem a circular hole. You need to make little snips in the hemmed portion so that it doesn't distort the circle when you fold it over (because there's not enough fabric in the bit you're folding over to match the bit you're sewing it to). The neckhole stitching might look pretty messy if you've done it on a machine... so hide it under some nice trim. Stick your head through the hole and belt the tunic closed.